""To create something new,"" says a character in David Henry Hwang's script for FLOWER DRUM SONG, ""we must first love what is old."" For Mr. Hwang and those who share his vision for what is arguably and controversially - the most radical reinterpretation yet of a Broadway musical, that line is not only at the heart of his story, but the guiding philosophy behind the new/classic musical now playing to standing ovations on Broadway. ""FLOWER DRUM SONG comes roaring back as if it were brand new,"" cheered Richard Zoglin in Time Magazine. ""Always entertaining, frequently affecting...it is a work of bravery and intelligence and real faith in the possibilities of musical theater."" David Henry Hwang began exploring those possibilities nearly seven years ago (see Happy Talk,Vol. 9, No. 2) in a process that brought him together with three giants of the past - Rodgers, Hammerstein and their co-author, Joseph Fields - and such musical craftsmen of today as director/choreographer Robert Longbottom, music adapter and director David Chase, orchestrator Don Sebesky and a superlative design team led by Robin Wagner (sets), Gregg Barnes (costumes) and Natasha Katz (lighting). With a sensational, fully Asian/Asian-American cast starring Tony winner LeaSalonga, FLOWER DRUM SONG opened at the Virginia Theatre on October 17. The original 1958 production was the first Broadway musical to deal with the Asian-American experience; the 2002 production is only the second. The sense of history, therefore, was palpable - not only on opening night, but from the earliest previews; and not only from the audience (which, from the start, included a steadily growing contingent of Asian-American theatregoers) but from the performers themselves. Alvin Ing, who plays the character of Chin in the new version, had played the role of Wang Ta in the original production's national tour and went on toplay that role in more productions than any other actor. Jodi Long, MadameLiang in this production, spent part of her childhood backstage at the St. James Theatre during the original run where her father, Larry Leung, was in the cast. The original company of FLOWER DRUM SONG stayed together as a family over the years, and was famous for its periodic reunions. An especially meaningful reunion occurred in early October, when over a dozen members of the Broadway, National Tour and film casts attended a preview performance of the new FLOWER DRUM SONG. Among them were Cely Carrillo (a Mei-Li in the original Broadway run), Susan Kikuchi (a child performer in the original Broadway cast, whose mother, Yuriko, appeared in original casts of FLOWER DRUM SONG and THE KING AND I), and Luther Henderson, Jr., creator of the original dance arrangements. Arabella Hong, who introduced ""Love, Look Away"" in 1958, and Pat Suzuki, the inimitable original Linda Low, are both ardent fans of this version and each came to see it several times during previews, and again on opening night. Joining Salonga (as Mei-Li), Ing and Long in the 2002 version was ""a first-rate cast"" (in the words of the New York Observer's John Heilpern) that included Randall Duk Kim as Wang, Jose Llana as Ta, Sandra Allen as Linda Low and Hoon Lee as Chao. On WBAI Radio, David Rothenberg cheered, ""The entire cast is excellent,"" and he predicted that ""audiences will love this musical delight!"" Audience response from the start was enthusiastic. Critical reaction, however, was divided, with the nay-sayers falling into two contradictory camps: those who felt that any reworking of the original version was a desecration, and those who wondered why Hwang had made the effort. R&H President Ted Chapin defends the production simply: ""We take risks,"" he says. ""That's what Richard Rodgers and Oscar Hammerstein did when they were around, and that's what their heirs continue to do. It's about having confidence in the durability of the works themselves, and being open to new ideas."" For most critics, the risks paid off. ""This little-performed 1958 musical,"" said David Cote in Time Out, ""shines in this jubilant, top-to-bottom revision. David Henry Hwang's wised-up book adds more humor and political savvy [and] fits perfectly into Robert Longbottom's seductive and opulent revival."" NY-1 critic Roma Torre reported, ""FLOWER DRUM SONG has been brought back to life, thanks to David Henry Hwang's funny, hip, politically correct sensibility, and Robert Longbottom's impressive direction and choreography."" Heilpern of the Observer felt that Hwang and Longbottom ""worked brilliantly...to create a new Broadway show of high and low seriousness, which was Rodgers and Hammerstein's intention in the first place."" In USA Today, Elysa Gardner observed, ""Hwang and Longbottom have retained the show's irresistible sweetness and added more of the unabashed grandeur that distinguishes Rodgers andHammerstein's best-loved material. And David Chase's new adaptations of Rodgers' music, much of which is presented in new contexts, are rapturous."" 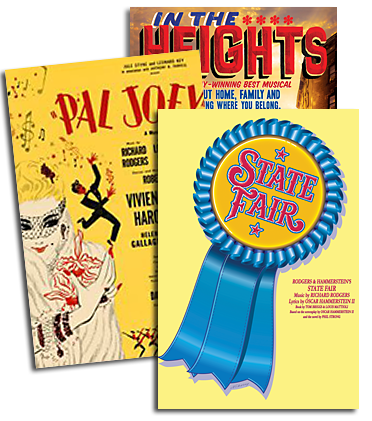 The score, which many critics felt had been previously overlooked when stacked alongside such towering landmarks as CAROUSEL, SOUTH PACIFIC and THE KINGAND I, had its own sweet moment in the spotlight too - it was what Cote of Time Out called ""pure honey for the ears."" Michael Sommers of the Newark Star-Ledger called the production ""a treat for the ear. Upbeat songs like jaunty 'Grant Avenue' and lyrical ballads like the luminous 'You Are Beautiful,' all dolled up with smart new arrangements, are characteristic of Rodgers and Hammerstein's melodious warm-hearted style."" In Newsday, Linda Winer cheered, ""Rodgers and Hammerstein's songs are as gorgeous as ever...Lea Salonga leads a first rate cast with lyric purity, internal pluck and knowing stillness."" Howard Kissel of the Daily News called FLOWER DRUM ""spicy and entertaining,"" and said that Don Sebesky's orchestrations ""capture the great score sharply and wittily."" ""It's an evening of enchantment,"" sighed Jeffrey Lyons on WNBC-TV. ""The updated version is vibrant, charming and has a lot to say about the Asian-American experience. Welcome to a long run."" 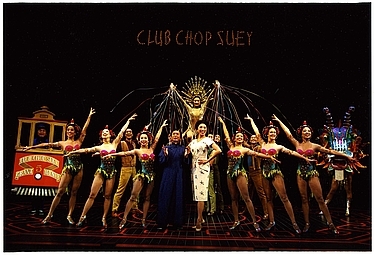 And so, after seven years, numerous rewrites, several readings and workshops, a sold-out run in Los Angeles, more rewrites and rehearsals, previews, an emotional opening night, upbeat ticket sales, a cast album recording, and with standing ovations from throngs of happy theatregoers, FLOWER DRUM SONG has returned to Broadway. A hundred million miracles are happening every day. FLOWER DRUM SONG is currently playing at the Virginia Theatre on Broadway; for tickets call Telecharge at 212-239-6200 or visit www.flowerdrumsong.com..The new original Broadway cast recording is currently available from DRG Records at all major music outlets or by visiting www.drgrecords.com.